Guitar Blog: How did Eddie Van Halen get so good on guitar? The obvious answer of course is practice but Eddie was not your typical guitar student. Where most guitar students do 30 minutes to an hour a day Eddie was more like 6 hours a day. The Van Halen brothers were fortunate because their father Jan was a trained musician who played clarinet, sax and piano. As children both Eddie and brother Alex were forced to do piano lessons which obviously paid off but at the first opportunity they switch to guitar and drums. Eddie actually started out as the drummer and Alex the guitarist but apparently Alex turned out to be a better drummer than Eddie. When Eddie made the switch to guitar he became an obsessed with practice. Van Halen hit the major music scene in the late 70's. I was a teen at the time and the first time I heard Van Halen's Eruption I had no idea what he was doing. 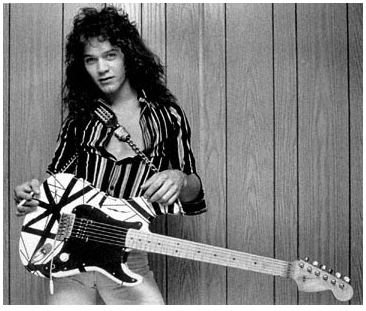 At the time I was still very much a beginner guitar player and Van Halen was like some kind guitar playing alien. It became apparent to me some years later that Eddie was simply the result of thousands of hours of serious guitar practice.